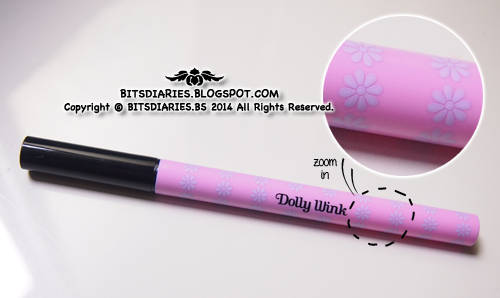 The liquid eyeliner comes in a sleek and sturdy pink plastic body with lilac flowery print, somewhat like daisy(? ), printed all over it's body and has a black plastic snap-on cap. The brush has a fine tip which makes it easy to control the thickness of each stroke. I got the Dolly Wink Liquid Eyeliner in deep black. It's in liquid-form(ahemm...it's a liquid liner ) but not to the extend that it will start dripping. Don't worry, it's mess-free! In order to prove to you whether this liquid eyeliner is smudge-proof or not, I told my mom to rub the swatches as hard as she could. 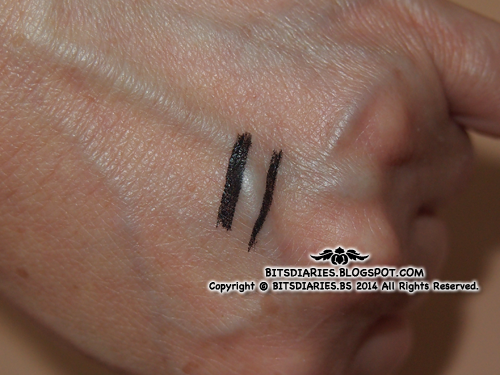 As seen in the video and pictures, the eyeliner swatches did not smudge all over like normal pencil or creamy eyeliner does. However, the color of the eyeliner swatches seemed to fade a little after rubbing it hardly. But well, with average rubbing strength, it does not fade that much nor that obvious. Anyway, I assume the color fading problem is not a major problem to any of us because no one would actually rub his/her eyes that hard, right? When the liquid eyeliner comes in contact with water, it will not get wash-off unless you rub it with force. Otherwise, it has pretty good resistance to water, holding out against sweat, sebum and tears. The eyeliner swatches in the '...after...' picture look a bit faded but actually it's not! That's just an illusion caused by the reflection of the camera flash. Pardon that, kay? I'm using cold water so the swatches need a few rubs to get wash off but if you rub it with lukewarm to warm water(not hot! ), it requires less rubbing and it will get wash off more easier and quicker. Just like what it claimed — "easy to be removed by warm water." During the filming for the 'Water Resistance Test', I requested my mom to left some bits of eyeliner swatches so that I can proceed on doing this 'Make-Up Remover Test'. 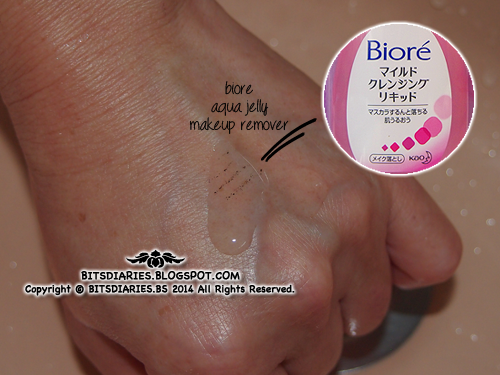 In this test, I'm using my all-time favorite makeup remover — Biore Aqua Jelly Makeup Remover. The bits of eyeliner swatches still stay in it's position — not completely removed. 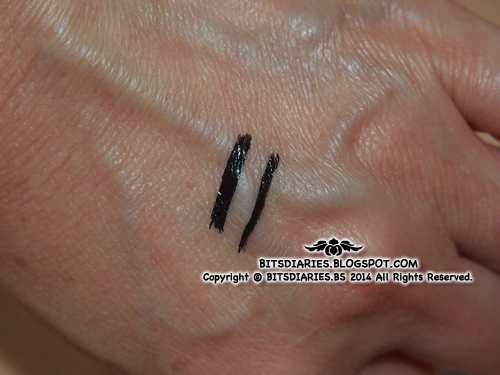 I used Biore Aqua Jelly Makeup Remover and as seen in the pictures attached above, it failed to remove this eyeliner. It does remove the eyeliner unless I use a tissue or a cotton pad to wipe it off after massaging instead of just rinsing off with water. By just using the Biore Aqua Jelly Makeup Remover, which only requires rinsing off with water after massaging, the eyeliner can't seem to be removed, even it is in it's slightest bits. On the other hand, lukewarm to warm water does the removing job as well! Anyway, this problem does not bother me as I usually use a cream-based makeup remover, cotton pads and q-tips to remove my eye makeup before removing the entire face makeup using Biore Aqua Jelly Makeup Remover. - easy to control, easy to use! suitable for beginner! - truly smudge-proof and sweat-proof! - it's expensive in my country! I got it for SGD24.90. Verdict: To be honest, this is my first time using a liquid eyeliner and Dolly Wink Liquid Eyeliner is my first liquid eyeliner in my life~ Yes!, I am a beginner! Back then, I'm so used to pencil and creamy eyeliners hence, I did not want to switch to liquid eyeliner. And now, I decided to try out liquid eyeliner because I'm sick of smudging and not long-lasting problems... Pencil or creamy eyeliners usually have smudging problem, yeah? I believe many of you have experienced the same problems as me before. 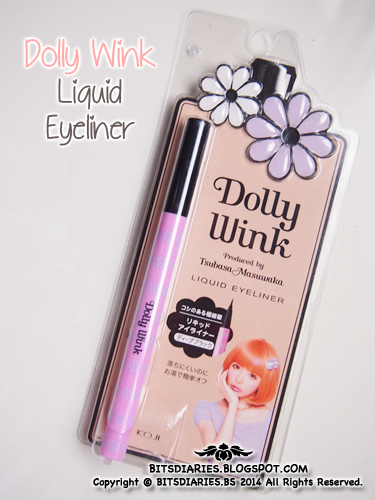 Anyway, this Dolly Wink Liquid Eyeliner is so easy to use! It's so easy that even me, being a beginner, I get hold of it immediately like an expert~ I use this eyeliner to draw my upper lash line and also to fill in the gaps on the lash line between my eyelashes. It dries quickly like within 10-20 seconds and is super long-lasting. I did not experience any smudging around the bottom lashes area on my first try~ Not even when I'm out walking under the hot sun and shopping for hours. Awesome right? I think it is! 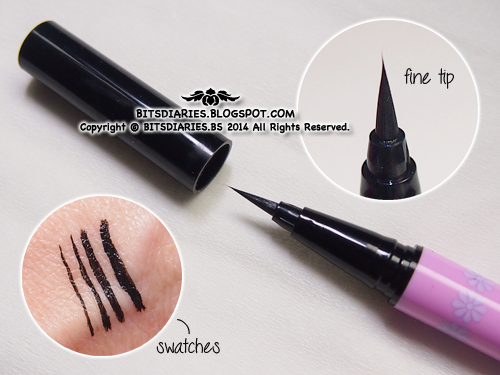 All in all, I absolutely love this Dolly Wink Liquid Eyeliner!